When the autumn weather turns wet and dreary, it is time for some food that will warm you from within. I’ve been feeling in a hole from illness and injury and the pumpkin pie, as nice as it was, wasn’t cutting it. Since it’s the start of cyclocross season (for some, at least, not for me any longer), I went with something that recalls the Belgium heartland: Vlaamse Stoverij. Also known as carbonnade flamande, it is a beef and beer stew with onions, mustard and various spices. Did I mention it has beer in it? The beer can really make or break this dish. Since it was my first time making it at home, I wasn’t screwing around and went with St. Bernardus Prior 8, an Abbey-style “Dubbel”. I made a good choice. The smell of the house while this was cooking was incredible. I tried to take a nap while it simmered on the stove but I was too excited to sleep. I ate mine poured over some mashed potatoes, but that took some of the focus off the great flavors of the stew. The little bit of leftover Prior 8 provided a nice companion. I can only guess the number of calories concentrated in this dish. With 4 of the last 5 days less than ideal due to rain, I had to conquer the weather lest in conquer me. So, despite the slick roads and iffy forecast, I headed out the door for a long classic rollerski when it appeared that the worst had passed. Within 5 minutes it was raining again, but I was dressed for it and there’s nothing quite like classic rollerskiing to keep you warm. I rolled through Newton, along Commonwealth Ave, up and over Heartbreak Hill, poling past the more dedicated runners, all the way out to Boston College. Then back along the same route. My pole tips weren’t grabbing well (despite brand new ferrules!) and my elbows were starting to hurt from driving the poles into the pavement. Eventually, I made some adjustments to my technique and that helped. I rolled through puddles with the skis sometimes hydroplaning and the murky water splashing up and into my face. I started to get chilled with my wet clothes on the long gradual descent home. Five minutes from home, it stopped raining. I was covered with muck. My boots were soaked. My arms were sore. But I was an hour and half the better for ski season. I rode myself into the ground the past few weeks. Saw the warning signs — increasing morning heart-rate day-on-day, scratchy throat, fatigue — but pushed past them all the same. There was so much going on. I was finally on a good rhythm but with the Mayor’s Cup race approaching, I was full-blown sick and skipping workouts. But I did the race all the same. I needed to. But I suffered for it. And I’ve been paying for it all week. Trying to transition back to dryland training. Trying not to feel sick. Fighting the sense that I’m losing fitness and falling behind. I keep having to remind myself to back off, ease up. Recover now, otherwise, I’ll be in trouble come ski season. So, I’ve drastically cut back my training program (less than 5 hrs total this week) to try for a full recovery. That doesn’t help because this time of year, with the daylight fading fast, cold mornings and workouts ramping up, it always feels like I’m falling behind anyway. And then there’s my foot. One week to go until the B.A.A. Half-Marathon. I was optimistic when I signed up for it back in July but my recovery from the foot problems has been slow. I have run only a fraction of the distance necessary to be “competitive” at a 13-mile distance and what I have run has been agonizingly slow and painful. My calves, especially. The ones that that gave out on me in the Mayor’s Cup. I’ll make a final call the day before the race. Today I skipped the rainy rollerski and did an easy 1-hour run. It wasn’t encouraging. The pace was slow. My foot hurt. My calves hurt. I felt tired after the hour. When I got home, I made a pumpkin pie — from scratch — to cheer me up. This piece describes my experience racing the 1995 Vuelta a Guatemala. It was originally published in VeloNews in the spring of 1996. I recently posted an article that describes a different side of this race in more detail. After 115km, I am cracking with my teammate Dave on the category-one climb, la Eterna. The Eternity indeed. We’re alone, off the pace from the leaders, on a seemingly endless climb with only the USA team car to support us. My knees and elbows still hurt from yesterday’s crash, but hanging on the van lets us soft-pedal and — hopefully — recover. This sixth stage of last fall’s Vuelta a Guatemala takes us 122km from Teculutan to Guatemala City. So far, the 13-stage, 1400km tour has given us five days of mechanical problems, 30km to 50km-long climbs, crowded finish lines, rotting bananas, potholes, firecrackers, loudspeakers. The Colombians and Guatemalans climb in their big rings, minutes ahead of us. We’ve already lost one U.S. team rider, and we’re waiting to lose another. Dave and I just want to finish. I have a hard time turning down a big bike race in a downtown setting, especially if it’s in my own backyard…even if I’m woefully underprepared. So, when I signed up for the Mayor’s Cup Boston a few weeks back, I knew I’d have my hands full. 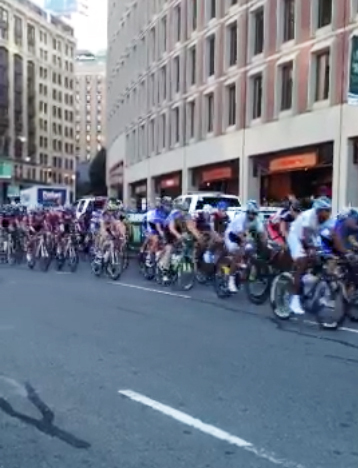 The race is the final event of the National Criterium Calendar and it attracted top professionals from the United States to a 0.7-mile course around Government Center for an hour of fun and misery. I would start the race still uncertain of my fitness, weighed down my a cold and a difficult week at work, hoping just to get to the finish. I read The Secret Race by Tyler Hamilton and Daniel Coyle. ‘Read’ is an understatement. I devoured it over three subsequent nights in pursuit of truth, forcing myself to bed when I wanted to keep reading, only to be haunted by doping dreams. I won’t evaluate the book on literary grounds. It was well written enough. It felt honest, authentic, believable. I’ll admit I ridiculed Hamilton for his so-called “chimera defense” at the time he tested positive for blood doping. Like so many riders before him, he took the path of denial, but now admits to coming clean. I want to believe him this time. This is also a personal story for me. I grew up in New England racing with Tyler. The daylight is fading fast this time of year. The rapid ransition from summer to autumn goes all too quickly. There is already a crispness in the air. The sunlight hits at a low angle and casts long shadows across the roads and trails. The change in seasons puts pressure on my workout schedule. It’s grown too dark in the morning to do anything meaningful outdoors. There’s little time to waste between the end of a the work day and the workout. Tonight was a nordic workout. Specific strength intervals in a race against the coming darkness. Four sets each of V2, single-stick, and no-pole skate, one minute effort, recover. The V2 is a full-body effort. The kick, the crunch, the poling all firing in unison. My stomach hurts, my heart rate is pegged. I’m breathing in gulps. I’m going too hard. Single-stick loads the upper body, the arms especially. I can’t muscle my way through it, but I can get persist. No-pole skate still feels much harder than it should be. I’m good for 45-50 seconds, then I lose form and start dumping energy, slapping the ski onto the ground, letting my weight get back. And it all goes to hell. By the end of the session, the sun has set and I make my way back to the car in the twilight. At the car, I change into running shoes and head out for 25-30 minutes run in the dark to finishing things off. I’m splitting time between the end of the cycling season and the ramp-up of the nordic season. Tonight, there wasn’t enough time to be on the bike. I’ll race the Mayor’s Cup in a week and a half and that will do it for bike races for me this year. My cycling fitness has come back quickly but the Mayor’s Cup will be the real test. There’s something to be said for 27 years of muscle memory, even with the little or big interruptions along the way. I’ll carry as much of that fitness into the ski season as possible.